Engraved on back. "CH. 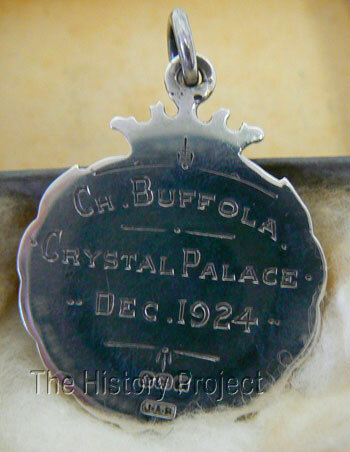 Buffola, Crystal Palace, Dec. 1924"
Brief History Silver medal awarded to CH Buffola, silver tabby Persian male, at the December, 1924, show held at Crystal Palace, London, UK. Acquisition Given to Richard H. Gebhardt by Blanche Bracey (Silverleigh) during a UK visit. Donated in 2009, by Mr. Gebhardt, to the CFA Foundation. Photos courtesy of The CFA Foundation, Inc. While the GCCF registration record for Buffalo of Silverleigh says "particulars unknown", he is listed in the Stud Book under the section for "Silver Tabby, Long-hair, MALES". We do know that Miss Bracey, of Silverleigh Cattery, was a breeder of Silver Tabbies, both Longhair and Shorthair, and also of Chinchilla and Blue Chinchilla cats2. "Silver Medal, 1924. 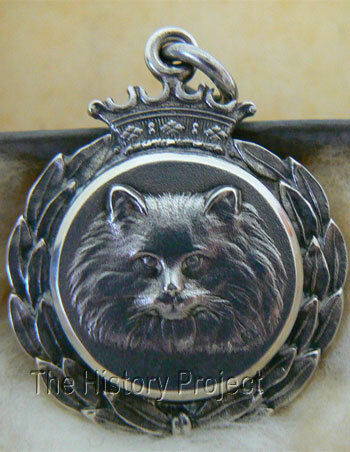 Awarded at the Crystal Palace for the National Cat Show. Won by Blanche Bracey, Silverleigh Cattery, Silver tabbies LH & SH, Chinchilla & Blue Chinchilla. Given to Richard Gebhardt on a visit to Blanche Bracey. Medal in its original box, RB Bennett, Oxford, England2. "